I thought I'd been rather restrained with my sowing of pumpkins, squashes and gourds. Even allowing for the old ditty "one for the vole and one for the crow, one to rot and one to grow" I'd hoped to have just the right number of plants that I could find a home for them all. In fact I've had nearly 100% successful germination and it's going to be a struggle as usual. If the plants were smaller it might be easier to discard some but they look so fresh and eager that I'll have to give them all a chance, probably damaging quality of life for the few by the needs of the many but that's the equation, for humans as well as cucurbits. Even if it does mean being swamped in courgettes again. Work has slowed down for a few days but more seeds are planted. Irish Prean seeds and wheat (a trial) went in pots outside three days or so ago along with some borage and coriander. Yesterday I planted up Lupini beans and soya beans in the heated propagator and today some herb seeds; sorrel, parsley, sweet cicely and more coriander in pots indoors. I also put some dill seeds into a tray but there are two problems with that, one is that the seed is so old it's probably past it and the other is that dill hates being transplanted so it's almost certainly doomed whatever happens. My brain is overheating this week and mistakes are being made. Outside sowings of cabbages, Kalibos and Asturian Tree, along with leeks Kelvedon and Solaise Bleu. Outside seed beds are unusual for me but I'm hoping they'll work and remove the need to buy in small plants in the summer which is my normal strategy. Still little prospect of rain, so watering is becoming a regular task although the temperatures have dropped a bit which helps somewhat. 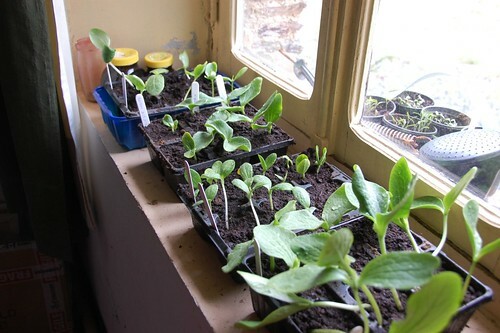 Most of my seedlings look puny but my courgettes look so good and I have 18 and will set them all. I had to get my husband with a digger to make me a bigger area for them. I am following your example in clearing some areas for potatoes. I hope you like courgettes! 18 plants will provide quite a harvest. If you are a beginning gardener may I recommend Geoff Hamilton's Organic Gardening as a useful starting point. It's a very practical book and will help set you on the right path to crop rotation and so on which are essential for continued good cropping. If they work we will have a lot, I know, and we are not that keen but a lot of our summer visitors are. However we can get our own back on the our lovely french neighbours who have been giving us their surplus for years.